Fuseli, Henry, 1741-1825, artist. 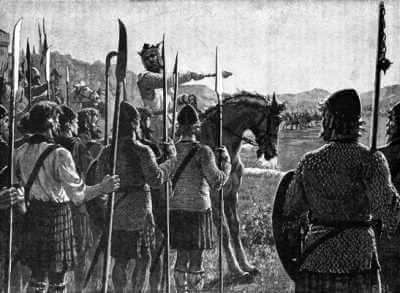 Macbeth consulting the vision of the armed head. (1793). 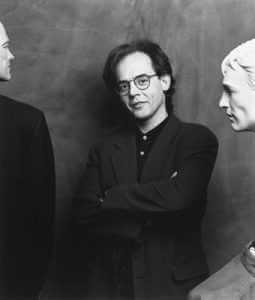 (under a Creative Commons Attribution-ShareAlike 4.0 International License). Common Core Aligned and More Engaging Than Ever. Students explore the erosion of conscience after a moral line is crossed. Intriguing Windows into History and Culture that Illuminate Shakespeare’s Darkest Drama. 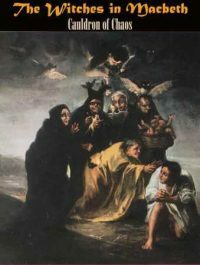 The Macbeth theme of conscience vs. ambition is explored in a Stratford, Ontario production in which Macbeth’s personality is split between several versions of the character. 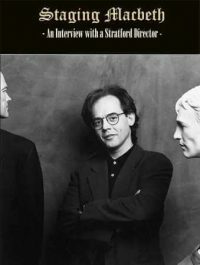 At the same time, Stratford Festival director Richard Rose, the former head of the Festival’s Young Company, teaches students to read the subtext of Macbeth from multiple viewpoints and to stage the play with a modern spin. This chapter is aligned with CCSS.ELA-LITERACY.RL.1, RL.2, RL.3, and RL.5 (for 9-10 and 11-12). Language Tug-of-Wars in the Scottish play – fair is foul and foul is fair – reflect major themes that students explore in this chapter. 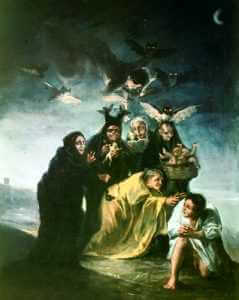 The extensive use of antithesis in Macbeth (opposites placed in what are virtually word equations: fair = foul and foul = fair) suggests the powerful thematic contrasts in the play: chaos vs. order, dark vs. light, and the hovering, passive force of the “Holy King” Edward vs. the hyperactive “hellhound” Macbeth. The “Word Wars” chapter teaches students a simple and fun way of identifying and interpreting antithesis, thereby helping them to grapple more effectively with the play’s themes. This interactive chapter is aligned with Common Core Language Arts Standards CCSS.ELA-LITERACY.RL.1, RL.4 and RL.5 (for 9-10 and 11-12) and includes activities. For additional activities that rigorously meet RL.4 refer to Macbeth Teaching Guidelines, Lesson Plans, and Supplements below and see “Shakespeare’s Figurative Language, Romeo and Juliet and the Renaissance, “Shakespeare and Caesar, Mysteries of the Mind,” Julius Caesar and Ancient Rome, from Republic to Empire and visit the Shakespeare Study Hall/Macbeth. Students learn to identify and explicate metaphors in Macbeth, particularly metaphors that illustrate the erosion of Macbeth’s conscience. This interactive chapter includes activities and is aligned with Common Core Language Arts Standards CCSS.ELA-LITERACY.RL.1, RL.2, RL.3, and RL.4 as well as Common Core Reading Anchor Standards: CCSS.ELA-LITERACY.CCRA.R.1, R.2, R.3, and R.4 (for 9-10 and 11-12). For additional activities that rigorously meet RL.4 see “Shakespeare’s Figurative Language, Romeo and Juliet and the Renaissance, “Shakespeare and Caesar, Mysteries of the Mind,” Julius Caesar and Ancient Rome, from Republic to Empire and visit the Shakespeare Study Hall/Macbeth. 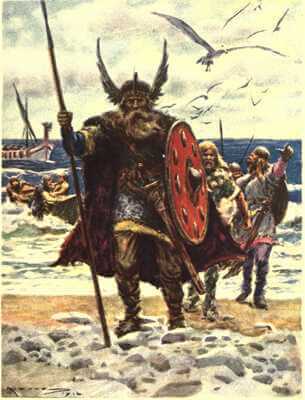 The Viking (Norwegian) invasion that begins the play is supported by Scottish rebels. Such alliances were typical in the 10th and 11th centuries. In this chapter students investigate the the Viking assaults on Scotland and the Scottish factionalism that it provoked. This chapter prepares students to understand not only the opening scene of the Scottish play, but also the closing scenes (Siward was a Viking). 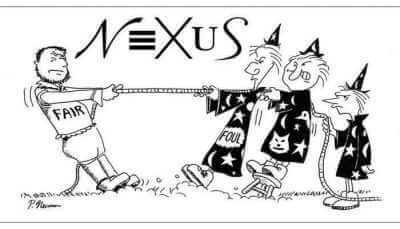 This chapter meets CCSS.ELA-LITERACY.RL.1 and RL.4 as well as Common Core History Standards CCSS.ELA-LITERACY.RH.2, RH.6, RH.8 and RH.9 (for 9-10 and 11-12). Students explore the Battle of Hastings – which reshaped Scotland during Malcolm and his son’s reigns nearly as much as it did England – through the Bayeux Tapestry’s scene-by-scene reenactments of the lead-up to the battle and the battle itself. 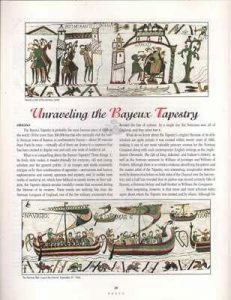 In addition, the Bayeux Tapestry provides contemporary views of feudal customs, military dress, battle tactics, medieval dining and so forth. This chapter includes activities and exercises and is aligned with Common Core Language Arts Standards CCSS.ELA-LITERACY.RL.1 and RL.6 and Common Core History Standards CCSS.ELA-LITERACY.RH.2 and RH.8. This chapter introduces students to the real Macbeth and Lady Macbeth and investigates the bloody competition for the throne that dominated Scottish politics throughout the 10th and 11th centuries. 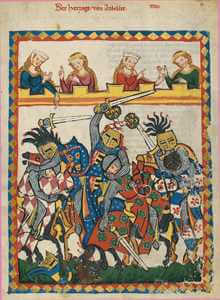 Students also explore the reign of Macbeth’s successor, Malcolm III, who was exiled at the court of Edward the Confessor during Macbeth’s reign. 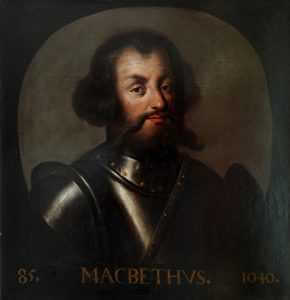 The death of Macbeth helped make the consolidation and Anglicization of Scotland possible under Malcolm (Shakespeare implies the latter in the final scene). 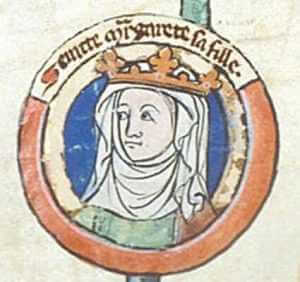 Students study the enormous influence of Malcolm III’s Anglo-Saxon queen, Saint Margaret of Scotland, on the next two centuries of Scottish history. 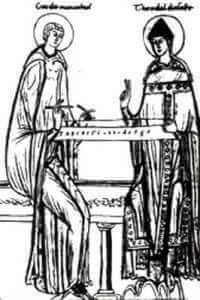 Malcolm’s and Margaret’s marriage was an important side effect of the Battle of Hastings. This chapter meets Common Core History Standards CCSS.ELA-LITERACY.RH.1, RH.2, RH.3, RH.6, RH.8 and RH.9 (for 9-10 and 11-12). 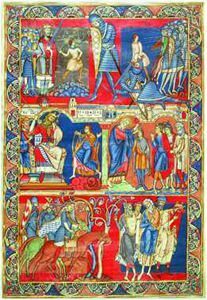 Students investigate Edward the Confessor’s role as an exemplary king in Macbeth. 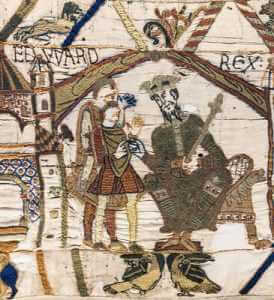 They also explore how events during Edward’s reign led to the Battle of Hastings. Shis chapter meets Common Core ELA Standards CCSS.ELA-LITERACY.RL.1 and RL.4 as well as Common Core History Standards CCSS.ELA-LITERACY.RH.2, RH.6, RH.8 and RH.9 (for 9-10 and 11-12). 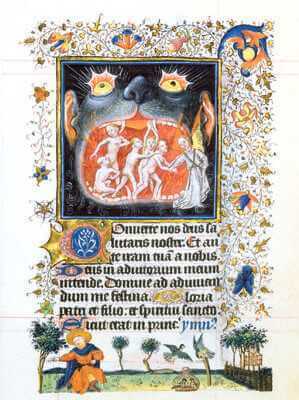 In this section students identify and explicate visual metaphors and contrasts in two medieval images of Hell Mouths and relate them to the Porter Scene in Macbeth. 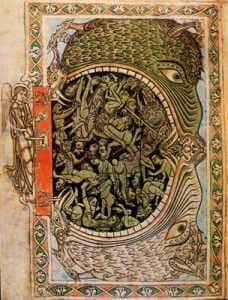 Morality plays about the Mouth or Gate of Hell were very popular during Shakespeare’s youth; the Porter’s allusion to the Mouth of Hell in Macbeth would have resonated with a Shakespeare audience. This chapter meets Common Core Language Arts Standards CCSS.ELA-LITERACY.RL.1, RL.4 and RL.7 (for 9-10 and 11-12). Students study the functions and styles of the medieval book or illuminated manuscript and learn to identify and trace image patterns in the illuminations of several manuscripts , including the 8th-century Lindisfarne Gospels (illuminated on one of Scotland’s “Holy Islands”) and a rose window. This chapter includes activities and meets Common Core Language Arts Standards CCSS.ELA-LITERACY.RL.7 and Common Core History Standards CCSS.ELA-LITERACY.RH.1, RH.2, and RH.8 (for 9-10 and 11-12) as well as National Core Arts Standards 7, 8, 9 and 11. 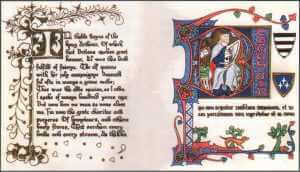 In this chapter, a modern manuscript illuminator takes students through the stages of illumination enabling them to illuminate a scene from Macbeth, using techniques discussed in this section, as well as patterns, limited palette and visual metaphors that reflect metaphors or themes in the play. This chapter meets Common Core Language Arts Standards CCSS.ELA-LITERACY.RL.4 and RL.7 (for 9-10 and 11-12) as well as National Core Arts Standards 1 through 8. 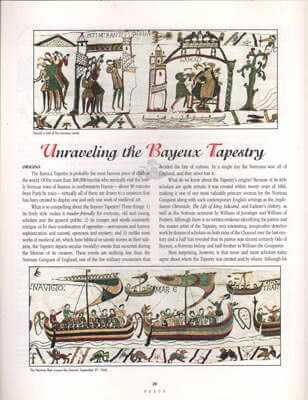 Students learn to read the pictorial language of the Bayeux Tapestry and the tapestry borders, which provide an alternative Saxon perspective that seems to contradict the Norman point of view emblazoned in the principle imagery. 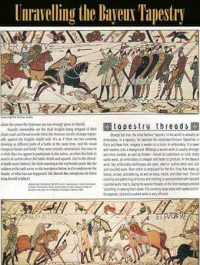 Students also explore techniques employed in creating this celebrated visual history of the Battle of Hastings. This chapter meets Common Core Language Arts Standard CCSS.ELA-LITERACY.RL.7 (for 9-10 and 11-12) as well as National Core Arts Standards 7, 8, 9 and 11. 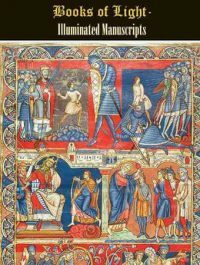 In this chapter students explore the work of Guido of Arezzo whose book on medieval music theory, Micrologus, laid the foundation for Western musical notation. The chapter also emphasizes the importance of recognizing musical patterns in sight singing. This chapter meets Common Core Anchor Reading Standards CCSS.ELA-LITERACY.CCRA.R.1 and R.7 and Common Core History Standards CCSS.ELA-LITERACY.RH.1, RH.2, and RH.7 (for 9-10 and 11-12) as well as Music Standards 7 and 11. 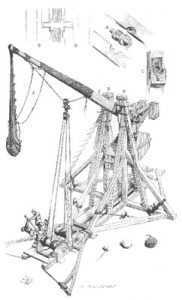 In this chapter students investigate the history and laws of physics associated with the most powerful weapon of the Middle Ages: the concepts of potential energy and work, and the physics of levers, hinges and rotational motion are examined. This chapter is aligned with the following Common Core Science Standards: CCSS.ELA-LITERACY.RST.1, RST.2, RST.3 RST.5, and RST.7 (for 9-10- and 11-12) and includes activities. Students examine the type of armor Macbeth and MacDuff would have worn, and they learn about the evolution of armor through the centuries. This supplement is aligned with Common Core History Standards CCSS.ELA-LITERACY.RH.1, RH.2 and RH.4 (for 9-10 and 11-12). 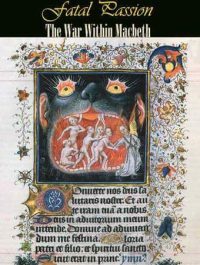 We introduce students to the Romanesque style, which spread from France to most of Western Europe during the Macbeth era. 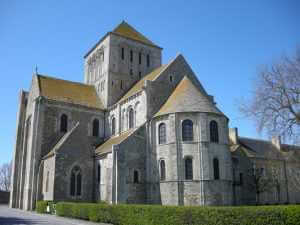 However, like other Continental influences, Romanesque Architecture reached Scotland late. 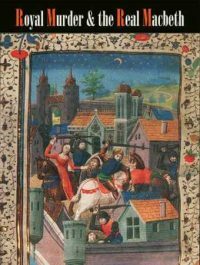 The supplement focuses on the Fortress Cathedral of Durham, which was begun in northern England the year Malcolm III and Saint Margaret died, 1093, and helped defend the border between Scotland and England. 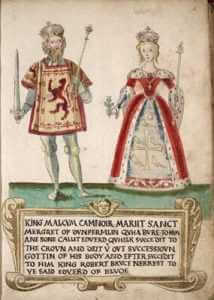 This supplement explores the unification of Scotland & England, which is alluded to in Macbeth. The unification of the two kingdoms began, of course, with James I, two or three years before Shakespeare wrote his tragedy. This supplement is aligned with Common Core History Standards CCSS.ELA-LITERACY.RH.1, RH.2, RH.3, RH.6, RH.8 and RH.9. (for 9-10 and 11-12). We provide free interdisciplinary Macbeth lesson plans and interdisciplinary activities for all subjects with class-set orders of Macbeth and the Dark Ages. 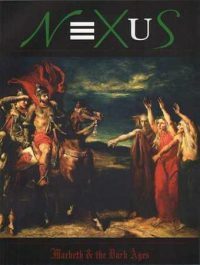 Downloadable Macbeth vocabulary exercises and quizzes, plot quizzes and the Macbeth Test are available in the NEXUS store.